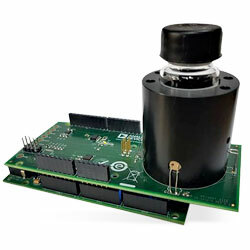 Analog Devices EVAL-CN0409-ARDZ Arduino Shield uses the ADPD105 photometric front end and a network of 860nm Infrared emitters and silicon PIN photodiodes to produce a water turbidity measurement system. The system can measure low to high water turbidity levels ranging from 0FTU to 1000FTU. The IR LED, and photodiode network is managed in such a way that it can carry two of the most recognised turbidity measurement standards – ISO7027 (both ratio and non-ratio) and GLI Method. With three-point calibration, the typical accuracy that the system can attain is ± 0.50 FTU or ±5% of the reading – whichever is greater. This accuracy coupled with the 0.05FTU noise level makes the measurements acquired using this system very reliable.